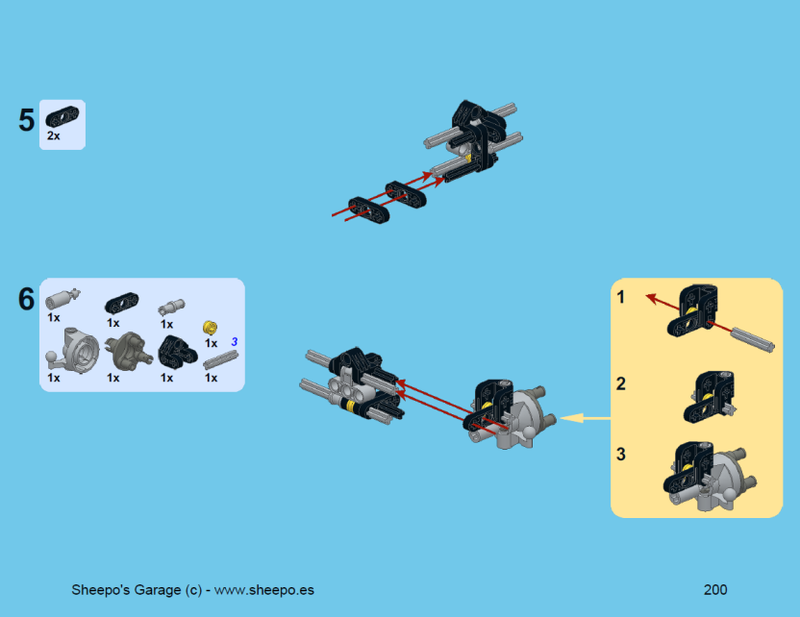 The instructions are made in PDF format, and they look very similar to the LEGO Official ones. 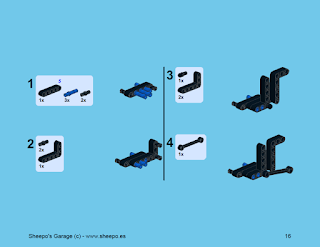 This instructions are available in RC and MANUAL versions. The whole car, including the controller has 2520 parts!!! The instructions have 496 pages, and 68MB. The whole car, including the controller has 2040 parts!!! The instructions have 410 pages, and 51MB. Please, before purchase the instructions read this! * MAKE ANY TYPE OF BUSINESS WITH ITS INTELLECTUAL PROPERTY, Like sell the car built, or rent the car to other people. - The price is in euros(€). But if your currecy is different don't worry: paypal do the exchange directly to euros from your local currency($, £, ¥...) for you. Also under special request I can accept a different way to pay the instructions. - The instructions will be send(actually a link to download it) to the payment email adress. If you want, I'll send you the instructions to a different email adress, please leave a comment in the paypal payment. - For MAC users: mac can't open zip files with password, to open the instructions you will need an extra software (you will can find a lot of free software in internet to do it). 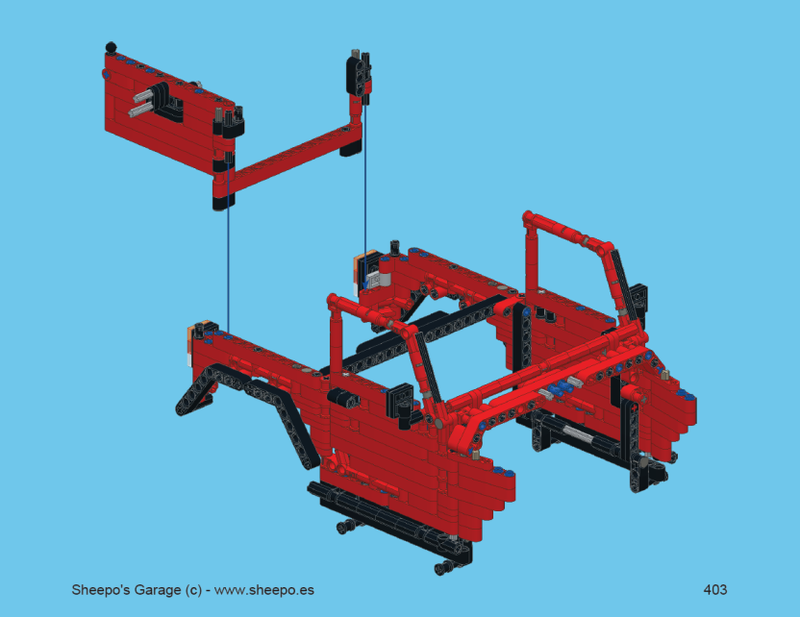 - Build this car is very hard, if you have never built a Lego Technic set, I recommend you to do it first. Doing that is not necessary but it will help you later when you built it. - The instructions has been tested by a Lego Technic expert builders, if you can't built the car and you think the instructions are wrong, please check your built twice before ask me. Also you must think that the pieces are not perfect, so the gearbox are not 100% reliable, it should make good around the 90% of the speed changes. - What happens if I lose my instructions copy(hard drive failure or virus)? -> I have a data base with all costumers of my instructions, if you lose it you can email me and will send it to you again free. This is fantastic, amazing detail. Do you know approximately how much all the parts cost to actually build it? I don't know, but it should be arround 450€ for the RC version and 350€ for the Manual ones. 1- Will you add it to the rebrickable? 2- Paypal is disabled in my country, how can I buy the instructions? Just a word : awesome ! Hi, what is the different between manual and RC version (except the PF motor)? if I buy the RC version, can I built the manual too? 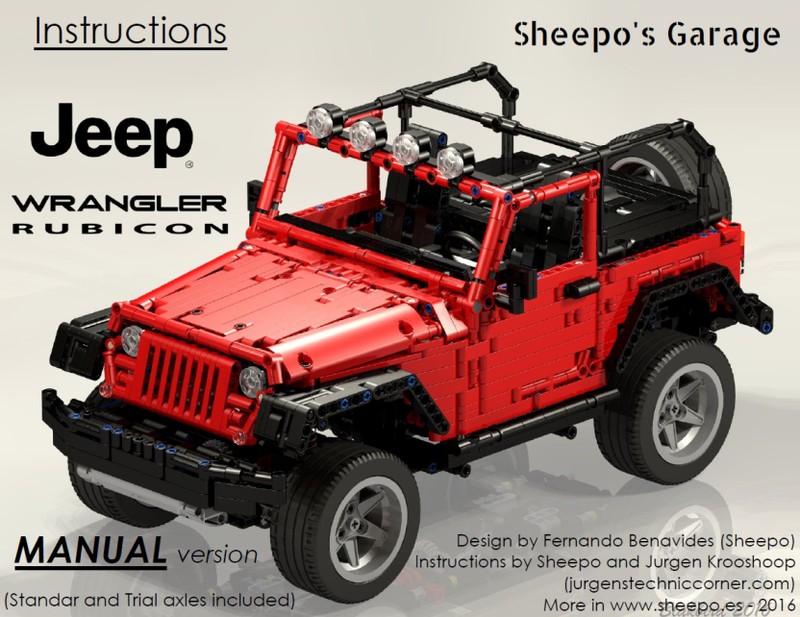 Do you have the Photos or the video for the manual rubicon? You can see it at the end of the video. Definitely. I would but the JK Unlimited version right away. Is it possible to use a Sbrick instead? How many motors must I buy when I will build the RC model? I have an another question. How many Sbricks must to this model? Where can I buy the pieces for this model? I can buy bricks from Lego.com to? -where did you get the rubicon and transfer case decals? Are there any parts for an execution in color black not red? Is the list of parts really complete? Wheel and rim only one? I'm going to build your fantastic Rubicon Jeep. But before buy the instructions please help me with a critical doubt. My models using V1 or V2 work perfectly in my home to range of 10 m. But in the park (2 blocks away) their range is extremely poor. (less 2 m). Sad situation. I guess that the cause is interference or similar. I'm going to use Sbrick, waiting solve this problem. In your Rubicon is possible replace the v1 or v2 IR with Sbrick? The functions and movements will work perfect? Do you know the reason to very big loss of range with V1 or V2 IRs in outside places like a park (city park)? Hi and sorry for the delay. As Lorenzo told you, you can use sbrick instead of IR receivers without problems. The problems with the IR receivers in the exterior is related with the sun and the walls in your home. The PF works with infrared light, inside your home the light bounce in the walls and the signal continue working, for that reason you have a lot of range, even probably you can turn a corner without direct line and you can continue driving the car. But outside there are not walls so the signal is not bounced and it loses in the air, also the sun emits visible light, but it also emits infrared light which interfere with the PF light. 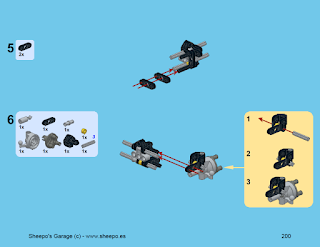 I'm looking forward to buy the instructions for this MOC, however I was wondering if there's a set that you recommend that would provide a large amount of the parts (and then get the rest from Bricklink). For example, the Unimog? Hope my question makes sense. Thank you for the awesome creation! Thank you for the information. It has helped me and sorted the primary problem. But people should go to vehicle service manuals jeep expertise for a usual check if there is any other problems. sprinklage maroc and flood monitoring as well for dwellings to assure you that you’ll be safe from all these hazards. You’ll have the option to bundle your protection systems for a custom fit for your abode and businesses. You’ll have free screenings to see what is the best system for your home and commercial enterprise by experts. SHOULD MAKE INSTRUCTIONS FREE OR CHEAPER. At Secretcraze , we're always looking for ways to exceed your expectations. If you have forgotten your password, if you have questions regarding the status of your order or about order tracking, product availability, we are here to help you get the most out of your shopping experience. Hi. I want to buy your MOC wrangler rc, but I live in the Crimea, and pay pal does not work here, if any other payment methods are available, please contact me by email.